JustCo, Southeast Asia's largest provider of creative co-working spaces, joined hand with its strategic partner Sansiri, in celebrating the grand opening of the first JustCo co-working space in Thailand at AIA Sathorn Tower. Working individuals, business travellers and businesses of all sizes in Thailand can now enjoy a redefined collaborative working, connected vibrant and dynamic communities offered by JustCo in open, conducive and creative work spaces. JustCo’s presence in Bangkok marks its first step in regional expansion across Southeast Asia and other Asian markets. It also stands for the first milestone achievement of Sansiri in pursuing its Everyday Visionaries growth chapter with ambition to shape next-generation living and how people live, work, play and discover. “We are so delighted to announce our first JustCo centre in Thailand. Our partnership with key player in Thailand real estate sector like Sansiri is instrumental in helping pave the way for our accelerated growth in Thailand and Asia, through Sansiri’s in-depth expertise and experience in Asian markets and also connect JustCo to a large number of Sansiri residents. Thailand is one of the key business hubs in the region and its favorable geographical location coupled with infrastructure readiness make the country a key market for JustCo, as well as gateway to our regional expansion across Southeast Asia markets. We are here to create a powerful ecosystem where working individuals and businesses of all sizes can harness the benefits of the network effect through meaningful interactions, participation and partnerships among members at JustCo to bring many new opportunities and great success,” added Kong Wan Sing. Spreading over two storeys with a total area of 3,200 square meters, JustCo at AIA Sathorn Tower boasts vibrant interiors along with playful elements. The space design encompasses the use of industrial furnishing and raw materials, communal tables and swing chairs, together with splashes of vivid colour tones throughout various cosy corners. Services and amenities in JustCo include hot-desking areas, quiet pods designed for personal space, meeting studios, event spaces, as well as an in-house café, and a football and golf corner. Similarly, this co-working space will adopt the concept of fostering a community for the like-minded through various events and collaborations, targeted to connect businesses of all shapes and sizes. Conveniently located within the Sathorn CBD, JustCo at AIA Sathorn Tower is easily accessible and within walking distance to BTS Surasak, and also connected to BTS SuksaWitthaya Station (expected to complete by Q1 2019) over a sky bridge. JustCo planned to launch its second branch in Bangkok at Capital Tower, All Seasons Place, Bangkok in July 2018. JustCo also offers community platform called J App which is available on smartphone device and website. J App allows members 24/7 access to a platform where they can pre-book meeting rooms globally at any location, share ideas with other members either as an individual or as a company, and search for potential business opportunities among the wide network of ever-growing 12,000 high-quality members. Currently, J App website is available for JustCo members and J App for smartphone will be launched globally within the third quarter of 2018. “Today marks a thrilling new chapter for JustCo as they opened the very first branch in Thailand. I strongly believe that the synergy between our partners will lead us step ahead in fulfilling Sansiri’s ‘Complete Your Living Experience’ mission, with new types of living experiences that our residents will enjoy. Also, these strategic partners will strengthen our global presence as well as generate new revenue and bring added value to our residents and core business” added Mr. Apichart. Founded in 2015, JustCo is Singapore’s largest premium co-working space provider, with the belief that working together, is working better. It is continually challenging and redefining collaborative working, connecting vibrant and dynamic communities in open, conducive and creative work spaces. 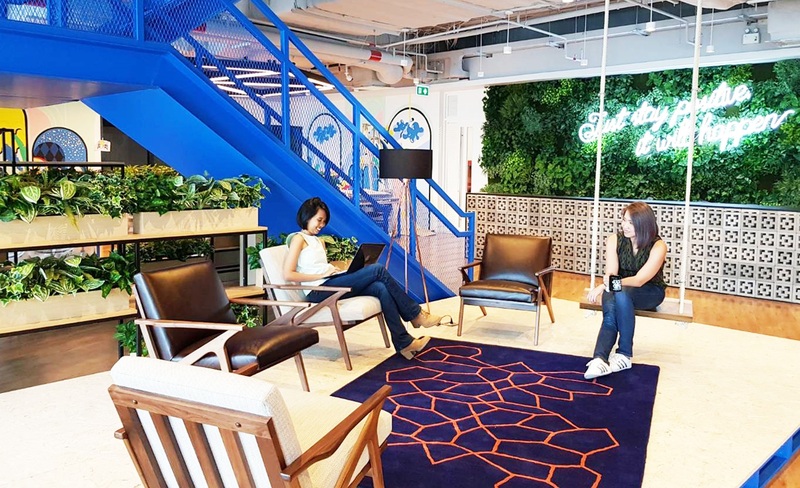 Moreover, JustCo has recently announced a joint investment with Singapore's sovereign wealth fund – GIC, as well as multi-national property company – Frasers Property, with an aim to develop a co-working space platform across Asia. The new injection of funds is a testament to JustCo’s strength in workplace technology and community management expertise in shared workspace business, and enables JustCo to build on its presence and expansion into other Asian markets including Greater China, Korea, Japan, Vietnam, Malaysia, the Philippines, India and Australia. JustCo is set to operate 100 centres across key strategic cities in Asia by the end of 2020. Sansiri is Thailand’s only fully integrated property developer, providing comprehensive services that go far beyond those of traditional developers. With over 34 years of experience and hundreds of projects across Thailand, including two hotels and a residential project in Kensington, London, Sansiri is widely regarded as Thailand’s leading developer of quality houses, townhouses and condominiums. Constructing meticulously designed, well-made homes, we strive to continuously improve the quality of life of our residents. In November 2017, Sansiri invested US$80 million in six leading global technology and lifestyle businesses in a bold move to expand its holdings and create a collaborative, multi-disciplinary portfolio. The six companies include: Standard International, One Night, Hostmaker, JustCo, Farmshelf and Monocle magazine. All six investments are in high-growth sectors in global markets which allow Sansiri to meet new trends, add value for its residents and further complete the living experience and integrate living, working and discovery.